If necessary, replace the propeller with center bearing shaft assembly. 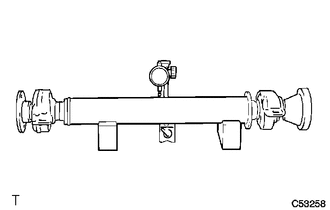 (a) Using a dial indicator, inspect the intermediate shaft sub-assembly. 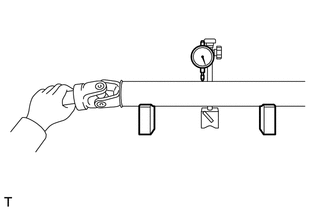 The dial indicator must be set at a right angle to the center of the intermediate shaft. If the shaft runout is greater than the maximum, replace the propeller with center bearing shaft assembly. 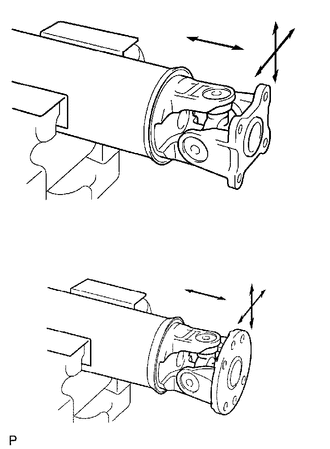 (b) Using a dial indicator, inspect the front side universal joint flange runout in the vertical direction. If the flange runout is greater than the maximum, replace the propeller with center bearing shaft assembly. 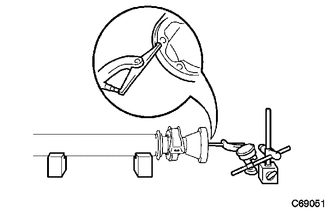 (c) Using a dial indicator, inspect the rear side universal joint flange runout in the vertical direction. 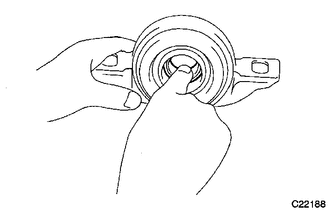 (d) Using a dial indicator, inspect the rear side universal joint flange runout in the horizontal direction. 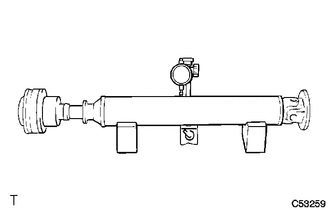 (a) Using a dial indicator, inspect the propeller shaft. The dial indicator must be set at a right angle to the center of the propeller shaft. 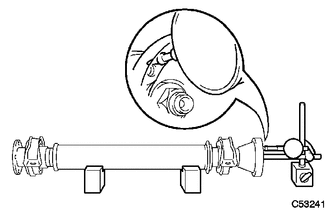 (a) Using a dial indicator, inspect the rear propeller shaft. 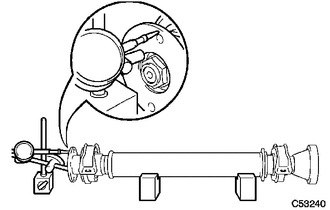 The dial indicator must be set at a right angle to the center of the rear propeller shaft. (a) Turn the No. 1 center support bearing assembly by hand while applying force in the rotation direction. Check that the bearing turns smoothly. (b) Check that the seals and bracket are not cracked or damaged. If the No. 1 center support bearing assembly is damaged, worn, or does not turn freely, replace it. (a) Turn the No. 2 center support bearing assembly by hand while applying force in the rotation direction. Check that the bearing turns smoothly. If the No. 2 center support bearing assembly is damaged, worn, or does not turn freely, replace it.